I use my interpersonal skills to help people to regain control over their business, profession, income, and lives by sharing my expertise about change, innovation, technology, science, and entrepreneurship. I feel very passionate to share my stories, knowledge and experiences with others to elevate them and help them grow. When I found that my insights were indeed valuable to others, it felt that I had finally found my purpose in life; speaking, training, counseling, coaching and mentoring. It started with small groups at vocational seminars and in-company training sessions. As my reputation grew I received an ever increasing number of invitations to speak at bigger events. Today, I am fortunate to be able to make a living speaking and training at my own events as well as the events of others. Up to 3 hours for a workshop or meeting, starting @ €/$/£ 5,000 (plus expenses). If I find the meeting meaningful and fun, I will refund you 80%. Speaking at an event starting @ €/$/£ 5,000 per gig up to an hour (plus expenses) or 50% of back of room sales (whichever is higher) - I speak without charge at selected charity events. Building or developing a business with or for you is €/$/£ 250,000 plus 8 to 15% equity or up to 1 million in gainsharing within 3 years. Training your team is €/$/£ 100,000 for 2 days in Amersfoort or €/$/£ 250,000 on location. If I find the training meaningful and fun, I will refund you 80%. If you'd be interested in hiring me, please contact my assistant via our contact page. 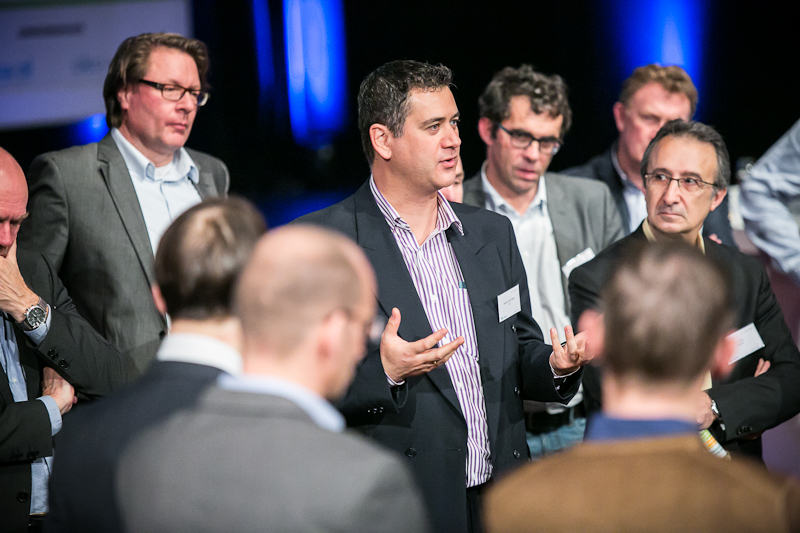 Debating a topic at the IPMA annual conference in the Netherlands in 2015. With more than 30 years experience managing, controlling, counseling, mentoring, coaching and directing projects, programs, organizational change, and portfolios of change, innovation and R&D, in over 25 companies, I have learned valuable lessons. I love to share these lessons in an anecdotal and practical manner. For PCO Kennis, an accredited training institute in the Netherlands, I train Registered Project Controllers how to navigate the uncertainties that surround projects, programs, and portfolios, and how to ensure benefit realization. On behalf of Dennis van der Spoel Consulting I am asked by companies and organizations around the world to facilitate, coach, counsel, mentor, speak or train in order to boost their ability to change and innovate. CHANGE@SCALE: Learn How to Easily Scale and Align Change Initiatives Through Clarity, Communication, and Courage. INNOVATE@SPEED: Learn how to Harness the Digital Transformation, Become an Exponential Organization, and Achieve a 400 Percent Growth in Revenue Within 4 Years. REALITY NEVER STICKS TO THE PLAN: Projects Can Be Executed 4x Faster and Cheaper With 4x as Much Impact. Want to Find Out? At Dennis van der Spoel Productions we organize events for individuals wanting to become a better professional. Ranging from one-day compact seminars to 3-day high value masterclasses, we cover topics such as project management, program management, portfolio management, managing organizational change, stakeholder management & engagement, benefits management, risk management, innovation management, team management and knowledge management. I have been involved in the startup of a dozen businesses and I have made numerous mistakes in the process; mistakes others now won't have to make. At Dennis van der Spoel Productions we organize events for individuals wanting to start a business or become a better entrepreneur. Ranging from one-day compact seminars to 3-day high value masterclasses, we cover topics such as a higher purpose, the inclusive mindset, emotional intelligence, creating the right culture, conscious leadership, moving markets, boosting sales, the lean startup method, growth hacking, content marketing, nudges and levers, community building, stakeholder integration, autonomy, the exponential mindset, smart creatives, staffing, leveraged assets, experimentation, business modelling, structuring, team building, viable product vision, the legal stuff, sales & communication skills and financial literacy. Banks need bailing out, governments keep printing fiat money, pension funds are in trouble as well, the real estate markets are volatile, the middle class is shrinking, and when you lose your job you'll soon find out that your house is not an asset. Your financial future is in dire straits and you don't know what to do about it? Then this is for you: becoming financially independent is actually quite easy; all it takes is drive, discipline and knowledge. You should be investing in assets that appreciate in value, generate cash flow and come with tax-benefits. And if you are smart, you can avoid using your own money to acquire them. 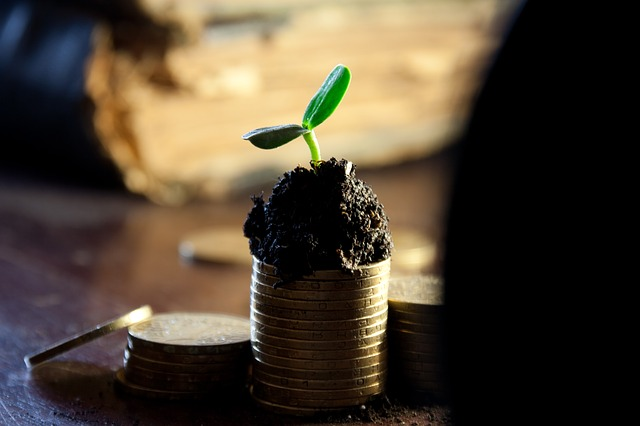 At Dennis van der Spoel Productions we organize events for individuals wanting to become an investor. Ranging from one-day compact seminars to 3-day high value masterclasses, we cover investing in real estate, fine art, precious metals, jewelry, gemstones, paper assets, forex and antiques. RAGS-2-RICHES: Learn About Money, Gold, and Real Estate to Achieve a Wealthy and Healthy life and Become Happy and Whole. Aspiring entrepreneurs, investors, leaders, professionals and specialists often find that a higher rank or degree doesn't automatically translate into success. While seasoned managers and entrepreneurs often find loneliness at the top, where the lack of feedback hampers personal growth. People today are no longer impressed or convinced solely by hierarchy, certificates or diplomas. What you bring to the table as a person matters more than the role you are hired to play. To be effective, personal growth must be a constant priority. INFLUENCE-4 IMPACT: Learn How to Use Levers and Principals of Persuasion to Rally People Behind Your Cause, So You Can Leverage Other People’s Time, Money, and Assets. Dennis van der Spoel Coaching provides high-end one-on-one coaching tailored to the needs of demanding senior executives. At Dennis van der Spoel Productions we organize events for individuals wanting to grow as a person. Ranging from one-day compact seminars to 3-day high value masterclasses, we cover mindfulness, self-discipline, persistence, self-esteem, confidence, memes, coaching, communication, speaking, team building, influencing, consulting, negotiating, sales, leadership, trust, time management, continuous learning, accountability and bias towards action. Oct. 15th, 2017 - Leadership-4-Growth is the world’s most complete and easy to follow business-building system for socially conscious solopreneurs and changemakers. It’s rooted in new insights, as well as modern day best practices that leverage the power of the internet. It covers the exact mindset, practical strategies, and approaches you need to grow a successful business... one that uses your unique talents and aligns with your higher purpose. If you’d like to grow a pain-free business that generates financial prosperity and supports a beautiful life while you focus on your passion to serve, then enrolling in this program will be one of the best investments you’ve ever made in yourself.